Sigra manufactures a suite of well control tools specifically for use in HQ size wire line coring. 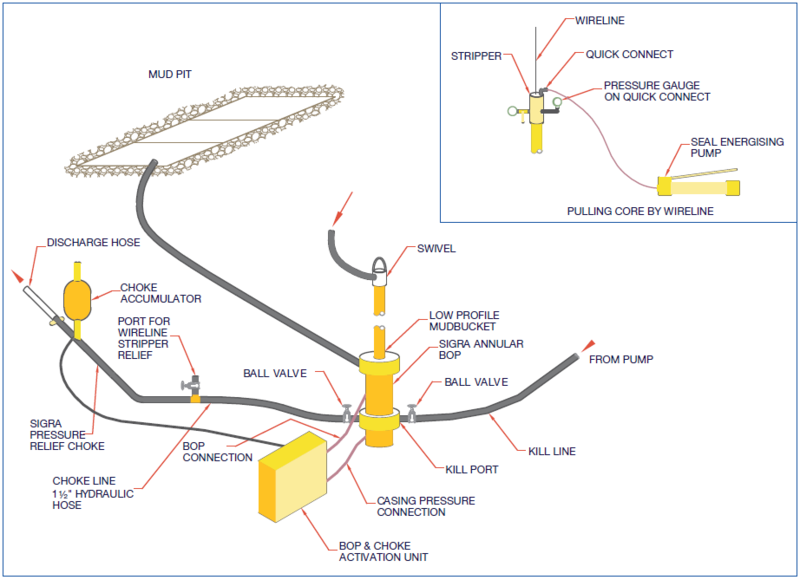 They are ideally suited for use in coal exploration where gas may be expected. The system may also be used for open hole drilling. The BOP is a small lightweight unit that is easily attached using a suitable sub, to the top of HWT or other casing which has been cemented in place. The BOP is fitted with choke and kill ports, each fitted with valves. The kill port may be connected to the rig pump while the choke port is connected to Sigra’s unique pressure relief choke. 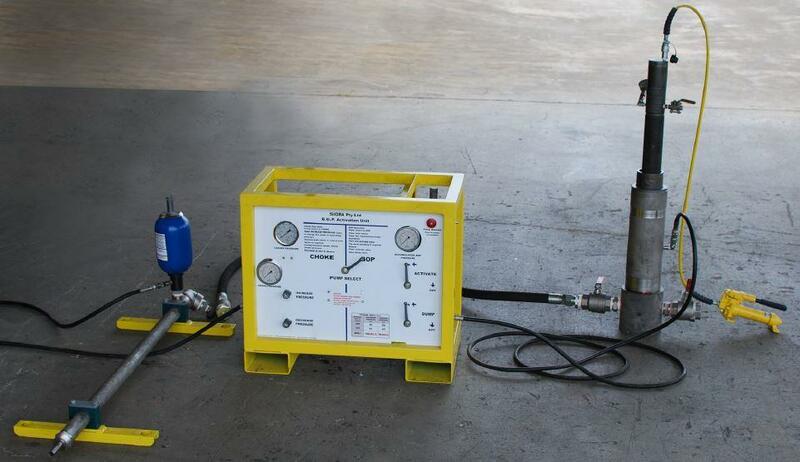 The Activation Unit comprises a compressed air powered hydraulic pump, backed up by a hand pump, to charge the accumulators used for the BOP and the choke. This small lightweight unit fits over the wire line and is screwed into the top of the drill string when the inner tube is about to be pulled. The small opening for the wire line in the top of the stripper generally prevents swabbing. During coring, fluid is pumped through string and returns come from the annulus into the mud bucket at the top of the BOP and back to the pit. If fluid outflow is detected from the borehole that cannot be accounted for by drilling fluid being pumped in, then the BOP should be closed and the choke activated. The annulus pressure in the hole should then be monitored. In the event of a positive annulus pressure additional fluid should be pumped into the well via the drill string to circulate out any bubbles. If the positive pressure is maintained at the well head then the mud being circulated needs to be weighted until this is not the case. Once this has been achieved drilling may recommence. The most common occurrence of blow outs in coring occurs due to the inner tube being pulled out of the hole too quickly thus lowering the pressure at the bottom of the hole. This process is called swabbing and may induce gas to flow into the hole and form bubbles that then eject the inner tube in an uncontrolled manner. In the event that uncontrolled fluid release begins to occur from around the wire line, core retrieval is stopped, the BOP closed and the seal in the wire line stripper is energised using a hand pump. A pressure gauge is then connected to the stripper to determine if there is any positive pressure. If this is the case then the choke is connected to the outlet port of the stripper and fluid is slowly pumped in through the kill port of the BOP so as to avoid lifting the inner tube. Once any gas has been circulated out and the surface pressure has been brought to atmospheric pressure by using drilling fluid, with or without the use of weighting agents, then core recovery may recommence. Sigra blow out preventers are small, lightweight annular devices that operate in the lower pressure ranges where most coal reserves are found. Their inflation is via water or water –glycol mixes such as is used in vehicle coolant. They are actuated by hand or motorized pumps with accumulator storage. Their working pressure ratings vary between 7 MPa (1000psi) and 13MPa (1900psi). All units come fitted with choke and kill ports. They may be fitted with minimal height overflow mud collectors, or with static or rotary seals. Sigra chokes are not just restrictive valves – they are pressure relief valves that are made from an energized steel reinforced elastomer. This makes well control operations much easier as no constant pumping rate is required to maintain back pressure in the well. Sigra chokes may be used for well control in underbalanced drilling. Their unique capability to pass fluid and cuttings at a maintained back pressure makes them ideally suited to this application. Sigra chokes are manufactured in a number of sizes to suit varying flow rates. All devices are capable of maintaining a regulated pressure relief setting between 0 and 10MPa (1450psi). Sigra manufactures wire line strippers which are designed to prevent swabbing of a borehole while pulling an inner tube. They can also be energised to seal around a wire line in the event of a blowout. They contain a pressure gauge port fitted with a quick connect and a bleed or kill port. They are lightweight devices designed to 89mm (3 ½”) outside diameter and fitted with HRQ or HQ threads. The seals are readily replaced and the units are energised by a hand hydraulic pump. They are capable of holding back up to 10MPa pressure (1450psi). The Sigra manual activation unit is for use with both the 101 mm blow-out preventer and the 20 mm choke. It can be located up to 15 meters from the devices and provides a one-step centre for well control. It is air operated with a manual pump for backup. Activation is by hydraulics. At 60 kgs it is portable and compact. The unit is simple to operate and provides excellent control of the BOP and choke.